Read all four Mystery Dramas in Order. This fourth and final play of the four mystery dramas presents the culmination of the events foreshadowed in the earlier three plays, which should be read or reviewed before proceeding with the review of this play(1). The list of beings (humans, spirits, etc) includes most of those encountered already in the first three plays, but many of the humans are in spiritual form. The time of the events are about one year following the end of The Guardian of the Threshold. This is no easy series of plays to read or witness performed. The performance of the four plays in sequence takes over seven hours. The plays require study of a deep and serious nature. 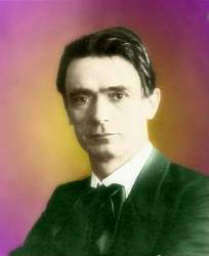 One can be said to be required to know all about Rudolf Steiner's works(2) before one can benefit from the insights he portrays for us in these intense dramatizations. He explains how tempted he was to explain these plays, but decided against it. [page 11] In response to various questions, I considered adding a few supplementary remarks in explanation of this whole Soul Portrayal; but again, as on former occasions, I suppress the attempt. I am averse to adding material of this kind to a portrayal intended to speak for itself. Such abstractions do not play any part in the conception and elaboration of the portrayal. They would only have a disturbing effect. The spirit reality here depicted presents itself to the soul as convincingly as the objects of physical observation. It lies in the nature of such a portrayal that a sound spirit vision relates the images of spirit perception to beings and events quite differently than the perceptions of the physical world relate to the physical beings and events. On the other hand, it must be said that the manner in which spirit events present themselves to the inner perception contains implicitly the character, disposition and composition of such a portrayal. In spite of his protestations outlined above, some readers may still wonder why Steiner would take such a hands-off approach to his important work in these four mystery plays. I can only offer the flesh of this Sufi story to those readers. One day a Sufi master was sitting at a table with an importunate disciple who always wanted to know why his master had done something in a certain way. On the table close to the master was a bowl containing one ripe peach. The disciple asked, "Master, would you give me the peach?" The Master said, "Yes," and picked up the peach and proceeded to eat all the flesh from the peach. He then handed over to the pupil the peach's bare pit. For similar reasons as Steiner offered above, the Master would not explain to his disciple why he ate the flesh from the peach. The flesh of the peach speaks for itself, just as Steiner's plays speak for themselves. To ask for an explanation of a play is to accept the peach's pit in place of the peach's flesh. Isadora Duncan told a pleading admirer, "If I could tell what my dance was about, I wouldn't have to perform it." We Americans have all seen the high quality wooden objects manufactured by German firms. When I was buying toys for my children, I recall the German wooden toys especially — they looked solid and sturdy and heads above in quality to their domestic counterparts. In this next passage, the factory manager is told by his secretary the reason customers are taking their orders to competitors. I hear now more and more in my trips. Hilary is the owner of the factory, and he has plans for adding soul to his products through the supervision of the workshops by the artist Thomasius. Hilary says that to have gained a view that labor can assume a noble form "if men of spirit put their stamp on it." And he has chosen Johannes Thomasius as the one to direct the workshops. the workshops that I build here, near to us. the useful molded into noble beauty. and daily life imbued with taste. the soul that gives it its true meaning. The manager objects that Hilary's project still lacks a leader to carry it out. Hilary is astonished that his manager cannot perceive as he does that the inventor himself should lead the project. As I read these passages, I could not help but think of Joseph Newman with his Energy Machine. His intuition brought the machine into being, but he has been unable to lead any project to bring the machine into a useful and salable product in the marketplace, up until now. Perhaps like with Strader the forces Newman requires are still inaccessible to him personally. The carrier pigeon who arrives with a message from a long distance away cannot locate the addressee on the message — to do that requires another skill. Inventors are like couriers arriving with a message who must turn it over to others for the final stage of delivery. Tesla successfully turned over his invention of Alternating Current to George Westinghouse and we enjoy its boon today, but Tesla kept four other inventions to himself which have been lost to us forever perhaps. What? is Strader then the man? when lacking common sense for true reality? without a doubt, to intuition's light. which Strader has believed were very near. which alone can bring it to reality. Strader has a problem with the Manager's approach which would keep spiritual aims separated from labor in the workshops. for times not occupied by daily work. to earthly labor in the world of sense. This next passage requires a bit of decoding. Read it first and make what meaning you can out of it. To me, it stands alone from the action in the play as a useful insight. Capezius is talking to Maria. far more than when it works in outward action. yet concepts are opposed to powers of vision. Words embody previously formed maps of reality whereas previously unknown and unexpressed realities can flow directly from the spiritual world. A true artist(3) takes in these direct realities and expresses them on a canvas or in a sculpture or a dance. Ersatz artists, whom we would more accurately call craft-artists, take their preformed concepts and render them into what they call artworks, but which are properly called crafts. The work of the craft-artists flow from what they perceive in the physical world, while the work of true artists flow from what they perceive from the spiritual world. Capezius notices a change in Johannes and confronts him. If one experiences a bleed-through from a previous lifetime, it can happen during times of quiet musing and the conflation of the two lifetimes can lead one into error. In this next passage, the Spirit of Johannes' Youth warns Johannes of dire consequences if he does not fulfill his youthful promises. Lucifer speaks to the young spirit of Johannes, and the Youth shivers at the sound of the word "Lucifer" in the next passage. As Dickie was kept locked in a cell, so did this Youth lead a sad and spellbound life. The message seems clear both in Bach's "Running From Safety" and in this play that one cannot leave one's promises to onself unkept except at one's own peril. The part of us to whom we made the promise lives as a spiritual being within us until we fulfill our promises. the border of this world's absorbing life. Strader dares to gaze into his abyss at the urging of Benedictus and Ahriman. He sees but "phantoms rush upon each other wildly .. Destruction reigns and generates fierce darkness. . . ." Maria comes to his help and urges Strader to build up his strength and illuminate his demons from the abyss. You can illumine them with your own light. Where is your light? . . . You radiate fierce darkness. Perceive your darkness, round about yourself . . .
yet you can never feel what you create. because your cowardice holds back your light. yourself in it is what you will enjoy. dreaming you sink yourself into yourself. Strader needs a weapon for the battle of soul he is undergoing, and Maria explains to him the various kinds of swords of Felix and Capesius so that Strader may better design his own sword. your paths of soul must use another kind. matured for deeds, to earth activity. our own from out soul-substance thoughtfully. Felix tells Felicia that he does not like her fairy beings because they are "mechanical, embodied dolls." This conjures up for me the latest fad in movie-making of recent decades known as Claymation, where clay dolls are animated and photographed a frame-at-a-time(4). It is the human equivalent of spirit entering into matter in Claymation and finding its way to many children and adults too. for that — you — stand — too high! can enter into matter, sense-perceived. of puppet-stages, shaped with artistry. to find their way to many, many children. The Manager confides in Romanus that he finds the spirit beings which Strader brings out in his words and being repellant. What if the power we feel we owe to others in our present life really stems from a power we wield that has been stored within us from a previous lifetime on Earth? which let you grow to full maturity? I am indebted to some past earth life? In the cosmic midnight the human soul has expanded to the orbit of Old Saturn, its fullest expansion, and will soon feel the pull towards Earth and a new incarnation in human flesh. During this time, the soul catches fleeting glimpses of its future lifetime, and while these visions fade immediately like lightning flashes and are soon forgotten, they are written as karmic threads into the soul. The soul in its next incarnation will discover these threads weaving themselves into karmic knots. 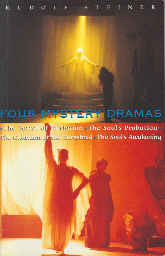 In my review of Steiner's book Three Lectures on the Mystery Dramas, I wrote a ten stanza poem on the four Mystery Dramas. Here is the text from Stanza II: Spinning knots from out of threads/Forming lives from living circles/Weaving one life where it leads/To where this karma lives in us. The threads of our karma life are formed during the cosmic midnight of our soul. You, Good Reader, in all aspects of your life today, are in the middle of the weaving process of karmic threads which were formed during your soul's cosmic midnight. Your very reading of these words with comprehension, uncovering insights for perhaps the first time, is part of a lightning glimpse of wisdom your soul received in the darkness of its midnight hour. can live in stronger wakefulness their colors. forever actively engraved in souls. that threaten soul-illusion as they roll. The dictum over Apollo's Temple in Greece said, "Know Thyself." We cannot know ourselves until we recognize that what we are taught in school to call the world is an illusion. What we call the world is but the garments covering reality and we err greatly if we confusion the clothing of a person with the person. Our schools are so powerful in their teaching methods that we often see things which aren't and act as if they were real. This process of everyday hallucination by the masses is amply illustrated in the story of "The King's New Clothes." It took a child, someone who has not been "carefully taught" to see the reality that the King had no clothes on. Since we are taught to take the clothes of the world for the world itself, if we are asked what happens if we remove the clothes (i.e. we die), then we must in conformation with our schooling say, "We cease to exist." Those who err in such dramatic fashion, and one may presume that the majority of many cultures do so, are those who need most the advice of the creed of Apollo. Know Thyself is know yourself as a full human being of body, soul, and spirit who lives in a spirit world between death and a new birth and lives through lifetimes on Earth perfecting oneself as a spiritual being(6). The Temple Warden guards entrance to the Temple against those who do not know themselves as full human beings. In his words, it may be helpful to some to translate "semblance" as "garment". the mystic has conducted thee to us. and semblance known by semblance fades away. O semblance of a semblance, learn now to know thyself. Capezius as the Hierophant signals the sweeping away of the garments of semblance to reveal the reality of the spiritual world. Fulfilled is what our ritual ordains. The soul has now forgotten what it was. which still in elemental strife lives on. The soul its inner core alone has rescued. as cosmic Word that speaks out of the flame. Maria is the Neophyte and she has been undergoing the Temple Sleep during the Egypto-Chaldean period (Third Cultural Epoch). She is called to awake in a similar way that each of us felt the call to enter our human body on Earth prior to this lifetime. and hold the sense of joy in warmth of life. I heeded your stern summons to awake. Maria returns to a study in Hilary's house, alone in contemplation, as if she has just returned from the Third Cultural Epoch and her initiation as a Neophyte. She is already beginning to be intoxicated by the garments of the senses she has donned and needs all the help from her "I" (Ego) to keep from losing the insights she has gained. created me within the universe. feel once again earth-clarity around me? when the Self again in spirit finds itself. Steiner wrote these plays in the period from 1910 through 1913 when airplane flights were new to the world, and yet in this next passage, it is as if he had piloted an airplane because he was aware that winged creatures and machines can gain the heights after sudden falls. We do not wish to fall, but we can take heart knowing that we can rise even higher after each fall. your wings gain strength as well by sudden falls. When the Guardian moves away from Maria, she resolves with the help of her spirit guides, Astrid and Luna, to raise herself to fullest awakening and knowing of herself as a full human being in body, soul, and spirit. in glowing light, unto my soul horizon . . .
his shining spreads forth calmness through great spaces . . .
pours strength into my being's deepest core. myself to fullest spirit wakening. in soul depths, power of will is fast asleep. When the Other Philia tells Johannes "I am in you; I'm part of your own soul. I am myself the power of love in you," Johannes protests, "You are alive for me — but where?" Johannes in this next passage repeats the answer he receives and it becomes a mantra for the entire set of four mystery dramas. my vision, without feeling, formed for me. The vision is that of Maria who gives this promise to him, "My holy, solemn vow rays forth new strength to hold for what you have gained." Lucifer claims Johannes for his own that he "obey my will." But Benedictus intercedes to remind us of the power of Maria’s vow to free Johannes from Lucifer’s will and that the fighting of Lucifer serves the gods. [Note: Benedictus finishes Lucifer’s assertion, “I meant to fight” by putting words in Lucifer’s mouth thus: “And (by) fighting (to) serve the gods.” ] This should remind us that fighting is not bad in itself, but serves the will of God when one strives for freedom from the coercive will of others. within this soul redeeming rays of light. He will admire you but not succumb to you. And fighting serve the gods. of spirit that appears to men as Nature. in spirit land or in the earthly realm. is hope that he can finally forget her. If you're afraid of X, you attract X to yourself because of the power you possess to attract those things which you hold in your imagination. You cannot fight X to get rid of it because fighting it only makes it stronger within your own mind. It amazes me that yet in the twenty-first century, so many people are unaware of this spiritual truth. Steiner has Romanus speak this truth about failure (X = failure). It only takes one short sentence to pronounce the truth, but it will take some people many lifetimes to arrive at its meaning and application in their lives. Success comes if you're not afraid of failure. in its true meaning for our special case. It shows us clearly how to think of Strader. where stands the Guardian of the spirit land. Strader shortly thereafter and the Manager, alone, says the words of occult wisdom we read in several places in the book, "That will come which has to come about." It is not words of predestined reality, but simply a statement of the reality that karma will weave in each person's life. Died . . . Strader . . . Is this reality? that guides the threads of life shows a stern face. and given it a part within this knot? Yes, that will come which has to come about. by one transported into spirit regions . . .
the spirit world laid hands upon me then. it sounds . . . How do I learn to comprehend it? The difference between a scientist and an explorer is that often the scientist attempts to form images of a place before they visit it, but an explorer always waits until an actual visit before describing the place. Strader, while a scientist, worked as an explorer, which is the way any true mystic works. To me it is clear that this is the way that Rudolf Steiner worked. to form in mind the picture in advance. what life could offer as its sum and substance. to which he was devoted with the deepest love. the earthly work to which his love belonged. you shall as spirit-star shine on your friends. into Maria's and Johannes' lives. attempts to spread Chaos' gloomy night. What is left for me to say without my presuming to eat away the flesh from the peach which Rudolf Steiner has passed across the table to us? When the eye rests for the first time on the design as a whole, it is most intrigued and impressed by the picture of the snake, forming the outer circle, as it were, in a protecting gesture. It brings to mind the situation in Goethe's Tale of 'The Green Snake and the Beautiful Lily' when the green snake formed a wide circle around the lifeless body of the Youth, and, 'seizing the end of her tail between her teeth, she lay quite still'. But the picture, as it presents itself here, wants to tell us much more. Is it not puzzling that the mouth of the snake is open and that the tail does not touch it? It 'breathes' a mystery which unravels gradually when one tries to forget for a moment the complete design, and begins with the so unobtrusive ring in the centre. One can identify oneself with it by feeling the smallness and within-oneself-secluded day-reality of Self. The person one is in this present incarnation has his own limited horizon; he lives in a world which he is shaping into his own world of soul. It is a decisive step when one tries to reach out to what is around and about one, what goes beyond this ring-existence. What one next meets in the design is a complete surprise. Letters, forming words, are displayed in a circle. One may remember that the spirit-researcher speaks of illumining guidelines which can be seen and read in the 'astral light' of the cosmos. Something similar is expressed here. 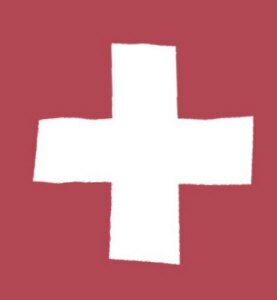 Where the zig-zag lines have attracted our attention, we begin to read: ICH ERKENNET S . . . up to here the circle is complete. We grasp the meaning(7), and read on by adding the next three letters which overlap: ICH. 'ICH ERKENNET SICH.' In English, a not quite satisfying equivalent would be SELF KNOWS ITS (ELF). It can be taken as a cosmic script, expressing the task of man's repeated lives on earth: that the I recognizes itself. It is worth the effort to dwell on this mantric line with the awareness of its cognitive character. It speaks to one's mind as a challenge to thinking. Then one is prepared to appreciate the next step in the drawing: the thought transforms itself into a picture. Now one has arrived at the image of the snake, forming a circle by turning its tail towards itself. Moreover, the three zig-zag lines point in the direction of the letters T S I and from there to the tail, approaching the open mouth, and the opened, watchful eye of the snake. The mystery that 'breathes' there is the awakening of the higher self in man. It becomes aware of the task to let live and weave and breathe in itself the Spirit in the Paulinean sense of the word. The ancient symbol of the snake that 'seizes the end of her tail between her teeth' is a pre-Christian one. With the design for The Souls Awakening, something is brought into the picture which is deeply connected with Theodora's prophetic 'vision in the First Scene of The Portal of Initiation: 'Not I, but Christ lives in my life and being. There is still another riddle left to be solved in the fact that the three zig-zag lines, the letters T S I and the tail and face of the serpent are placed at the left side of the circular drawing. There is a certain orientation evident, which could be connected with the four main directions in which the altars of the Sun Temple as initiation center are oriented, the Eastern altar in the zenith, the others clockwise, so that the Northern altar stands at the left side. The design for the fourth play emphasizes this Northern aspect. It has to do with the encounter of the forces of evil, in our time predominantly the ahrimanic forces. It makes sense that the three letters T S I in their sequence are part of the mantric line, described above. Read backwards, I S T, they express as 'IS' a state of mere existence(8) without the I's activity, the ahrimanic aim in earth evolution. when wakeful souls live through the Cosmic North. After having gone through the process of developing the design step by step, from the center to the periphery, the eye looks again at that tiny ring, expressing the. limits of our Self. Now it grows to something stronger, a condensed mirror-image of the circumference, not shrunk to a point, but a spheric microcosmic, living image of its macrocosmic origin. Footnote 2. At the minimum a study of Steiner's An Outline of Occult Science (aka Esoteric Science) is required. Footnote 3. See my essay Art is the Process of Destruction for what I posit constitutes a "true artist" : http://www.doyletics.com/artpofd.htm. Footnote 4. The 1994 film Faust used Claymation for many of its scenes intermixed with live actors and life-sized dummies. Footnote 5. DIRAK! is Matherne's Rule No. 7. Use the word "DIRAK" with an exclamation point and say it aloud if you must to call your attention to what you can do at this very moment to start some project in motion at the very moment you are thinking of it. Take action in the now because your lifetime is a series of nows and the moment now is the most important of all the nows. Every action happens in the now. DIRAK! Footnote 6. It is amazing how most religions get this only halfway right. They claim that we should strive to perfect our selves on Earth to live properly in Heaven, while the full truth is that we also strive to perfect ourselves in Heaven in order to live properly on Earth in the next lifetime. Footnote 7. RJM: In German erkennet is a form of the verb erkennen which can mean to know, to recognize, or identify or a bit of each together. Ich is equivalent to "I" and Sich to "Self" in English. Thus, it could be interpreted as saying in English that our "I" begins intimately to know, recognize, identify, and grasp its real Self., something which, rightly understood, can only happen over many incarnations. Hans Pusch Note: In the design, the 'J' represents the curved form of 'I'. Footnote 8. RJM: The German word ist has the equivalent word is in English. Ahriman's wish is for us to remain alive solely in the realm of the Earth without progressing upward into the spiritual realms as is our rightful and intended destiny as full human beings or anthropos. Footnote 9. RJM: To understand the cosmic midnight's relationship to Saturn in the play, one must grasp how human beings began in the Saturn stage of cosmic evolution and shrunk down to Earth. After death we expand spiritually outward as far as the spiritual orbit of the Saturn stage before taking the return trip to Earth in a new incarnation. Thus, Saturn represents, like midnight does to day-time, the darkest time — when one is furthest from life on Earth. In this way a human being recapitulates cosmic evolution during the time between physical death and a new birth. For details on this a careful reading of Steiner's An Outline of Occult Science (aka Esoteric Science) is recommended.